2016 seems to have been a glitch year for many. Whether or not it was actually as bad as Twitter would have us believe is probably up to you. Around here, things seemed to go pretty well. In fact, it was so busy, I seem to have neglected to post a single, solitary blog. Heh heh. Heh. Hmmm. Well, the past is the past, and hey! It’s New Year’s! Time to turn our collective backs on 2016 and look forward to what 2017 might have to offer. If we consider this Week 1 – our big news is the completion of the Calgary Stampede Promotion Committee’s Batter Boys Wagon Cover. This is a pretty cool rig that they’ve got. Essentially, they’ve converted a trailer into a mobile pancake-making machine. Now, if you haven’t been to Calgary, you might not know that for 10 days each year, people line up in droves to eat pancakes. It’s kind of our thing (a thing related to other things – you’ll have to show up to really get it). It’s what makes this wagon so cool! They hook it up to a truck, haul it to the Breakfast location, and BOOM – pancakes! I’ll do the big reveal on the next post so stay tuned to see what it looks like under the shiny red cover! The Calgary Stampede looms large on this city’s event schedule. Beyond the organizers themselves, most businesses prepare for the occasion somehow. Store windows are painted with cowboy themes, bales of hay are strewn about, and jeans, buckles, and hats abound. It’s a festive time for most but it’s the busiest time of year for those of us who supply the goods! 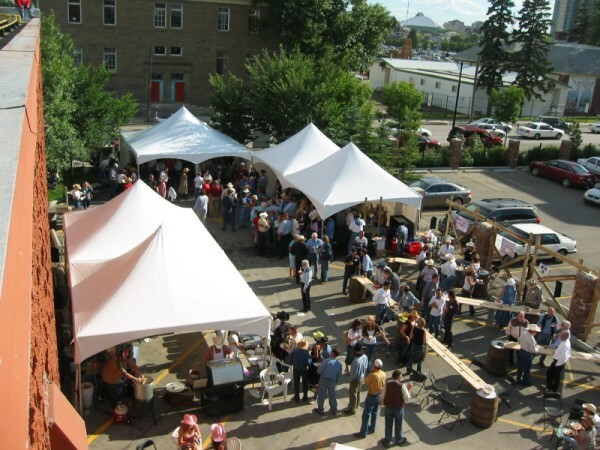 From installing party tents to supplying drivers’ chuckwagon covers, our staff work long hours making sure that our piece of the puzzle is firmly in place. We’re thankful to have such a diligent crew. Today is Day 1 of 10 on the grounds. We hope you take an opportunity to see what the city has to offer during the event, not only at the Exhibition, but throughout the city. I think you’ll see a real coming-together of people, great community spirit, and some very lively entertainment. Enjoy yourselves out there! Yeehaw! If it’s not a Pancake Breakfast it’s a Stampede BBQ!